Daenerys Targaryen (Emilia Clarke) has undergone one of the most dramatic transformations over the past three seasons of Game of Thrones. She begins a helpless pawn, but grows into the Mother of Dragons and a conquering hero. Like Sansa Stark, Daenerys’ character development is visually shown in her costumes, designed by Michele Clapton. At the beginning of Game of Thrones, Daenerys is under the tight control of her brother, Viserys. Viserys sees her as nothing more than a tool to get what he wants, arranging a marriage to a terrifying war lord just so he can build himself an army to fight for the Iron Throne. Daenerys is weak and scared. Her Grecian gowns are shades of very pale lavender and pink and made of flimsy silk, reflecting her frailty. The dress she wears to meet Khal Drogo, her intended husband, is translucent and hardly structured, placing her conspicuously on display. This reaffirms Daenerys position as merely a body to be bartered. Daenerys does not stay vulnerable for long. As she settles into her role as Khaleesi and slowly finds love with her husband, her wardrobe changes to reflect this new status. She dresses in the style of her people, the Dothraki, wearing a top of roughly woven cloth, twisted rope, a split suede skirt and form fitting trousers. The coarse fabrics imply her character is growing stronger. She is becoming more comfortable both with the Dothraki and herself. The woven cloth also resembles dragon scales, a hint to who and what she will become. Her trousers are not only practical for horse riding but a reflection of her growing power; she will soon be an comparable match to any man. After the death of her husband, Daenerys and her small band of loyal followers wander the desert until they find refuge at the city of Qarth. In Qarth, Daenerys hopes to gain an army to take back the Iron Throne. Thus she must look to the people of Qarth like a queen. She sheds her robust Dothraki clothes for light empire dresses worn by the women who inhabit the city. But this is only a disguise, meant to woo those in power to get what she wants. The decorative metal collars and belts symbolise a type of armour, as if she is aware of her vulnerability. 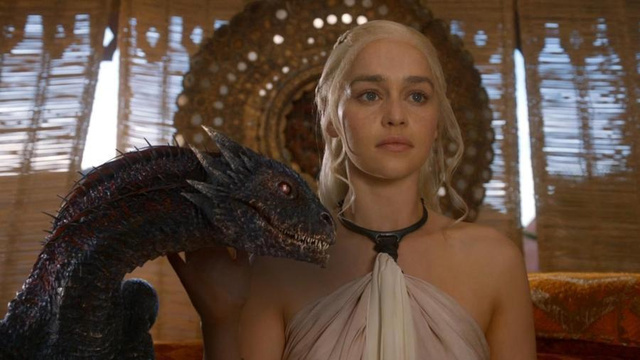 Daenerys’ might becomes clear at the end of Season 2, when she retakes her stolen dragons and conquers Quath. Her authority is represented by a form fitting ensemble constructed of fine leather, canvas and suede. The top portion is made of pieced together leather, the strength of the material and molded fit reflecting the strength of her character. As decoration, and a mark of her high status, there is a wide strip of fine mauve fabric running down the front. The skirt looks similar to the Dothraki ensemble – this reaffirms her identity as Khaleesi. It is also worth noting that once again Daenerys is wearing trousers implying her standing as equal to men. Season three sees Daenerys conquering cities and freeing slaves. Her main outfit is practical; a paper silk ‘dragonscale’ wrap dress and form fitting trousers. However, the dress has noticeably changed to an intense shade of blue. This is not the first time Daenerys is seen in blue; her Qarth dress is actually the same colour, albeit a lighter hue. Traditionally blue is associated with the Virgin Mary. In Christianity, the Virgin Mary miraculously gave birth to Jesus, who would become savior of the Christian people. The parallels to Daenerys are clear. She miraculously “gives birth” to her dragons, and she is a savior of slaves. At the end of Season 3, newly freed slaves chant “Mhysa”, a Valyrian word meaning mother. With this final costume, Daenerys has transformed into a warrior queen. Accompanied by her dragons, council (who also wear splashes of blue) and army, she is almost ready to seize the Throne. By Katy Werlin. Katy writes about fashion history at her blog The Fashion Historian. NOTE: This analysis was based solely on the television show with no reference to the Game of Thrones series of books. © 2013 – 2015, Contributor. It helps tip viewers off that she’s really addressing the enslaved soldiers and servants in the scene to foment an internal rebellion, while also insuring the diplomat would underestimate her abilities as a ruler. Great insights on the season 2 ending costume, as it seems like the first one that she had any part in designing. “Dress for the job you want” must have some Westerosi equivalent.